HOMEMADE Blueberry Jam recipe made from 1 pint of blueberries! This easy to make no pectin, no sugar recipe is perfect for eating and canning. This healthy jam is delicious served over toast, pancakes, french toast and ice cream! We’re jammin’, I wanna jam it wid you. We’re jammin’, jammin’, And I hope you like blueberry jammin’, too. I was craving fresh blueberry jam but I didn’t want to make a big batch of it, in fact I wanted to make jam with just 1 pint of blueberries. Maybe you’ll pick fresh blueberries from your garden or maybe you’ll pick up a pint of blueberries from the farmers market, either way you can enjoy this easy and quick recipe. This jam recipe is incredibly easy to make! You’ll want to add 1 pint blueberries, honey, cinnamon and lemon juice to a saucepan. Bring it to a boil for about 30 minutes, or until it’s jam consistency, giving it a stir every few minutes to make sure it doesn’t stick to the pot. 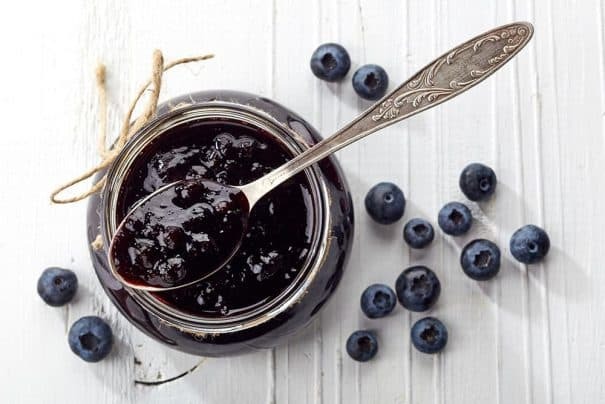 This jam recipe can easily be tweaked to other berries – like blackberries or raspberries too! A few people reached out to me to ask me if they could use frozen blueberries in the recipe instead of fresh… well you can! I prefer fresh berries for this recipe but frozen berries will still taste good. Just make sure to defrost the blueberries before you add to the pan, and keep a eye on the jam as the berries might cooker quicker than fresh ones. How many cups is 1 pint of blueberries? 1 pint of blueberries equals about 2 cups fresh blueberries. Don’t you love how flavorful blueberries are? I love that they’re so tiny but filled with flavor! They’re great to add to muffins, or overnight oats, or just enjoy on a piece of toast (like this jam!). 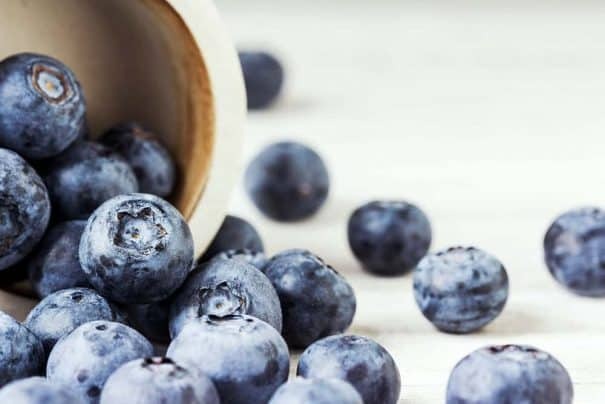 In case you needed more reason to like blueberries, they also are high in antioxidants, boost brain health, support digestion and promote heart health! 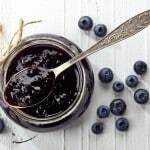 I love spreading this blueberry jam on toast, muffins, peanut butter and jelly sandwiches, pancakes, french toast or more. It’s also delicious served over ice cream! However you serve it – I hope you enjoy it! Looking for more jam recipes? Check out my raspberry jam, watermelon jam and strawberry peach jam. Need more Summer recipes? Try my Cantaloupe Salad and Cucumber Bread! Bring to boil, then simmer for 30-35 minutes until jam consistency. Thank you for the tiny batch recipe! My daughter loves everything blueberry. How long would it last in the fridge? Hi Jamie! I would easily say 3-4 weeks, if not longer. I’ve only gotten to a few weeks because it’s usually all gone before then! Blueberry jam is my favorite! I love that you made a smaller batch, sometimes that’s all you need:) Your jam looks so pretty and good. I could definitely go for a few slices of toast with this:) Thanks for sharing and enjoy your day! Thanks Kelly! I hope you have a great day too! Are you sure it wasn’t Mister Donut? Because it used to be Kentucky Fried Chicken and Mister Donut and then they demolished both buildings and rebuilt them as KFC and Dunkin’. There’s not a lot about Mister Donut on the Internet. 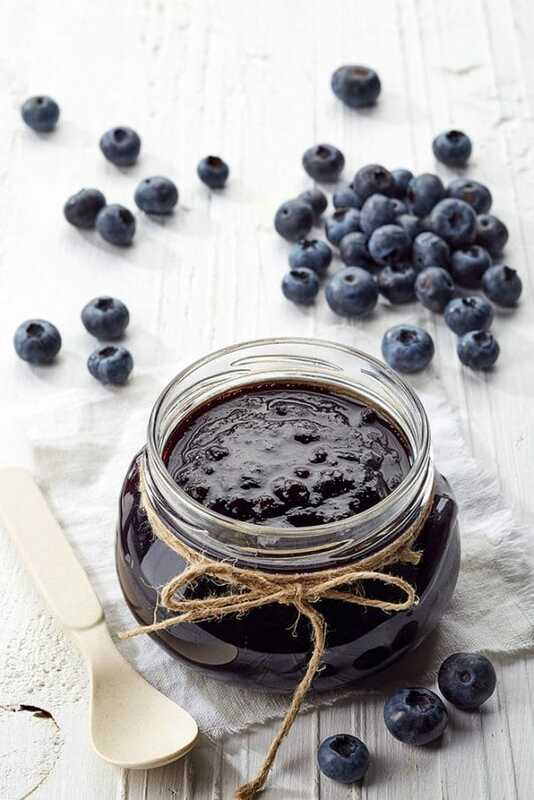 Love how easy this fresh blueberry jam is to make. I’ve made blueberry compote which isn’t as thick as your gorgeous looking jam. Thanks Jeanette! I love a easy to make jam! It’s funny, because every time I make jam I sing bob marley too! 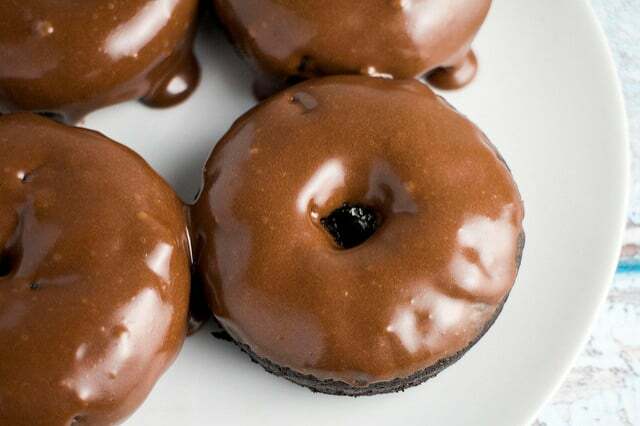 Love it, I have no idea what mister donuts is, but it’s made me hungry…. Brilliant jam, really rich, I want! Thank you!! This is exactly what I have been looking for. So basic and simple and yet entirely divine. Looking forward to spreading this on my toast! This looks ridiculously good! Making ASAP. Need to get some blueberries! I hope you like it Rachel! Enjoy! There are so many things I like about this. Last year I tried to make a HUGE batch of naturally sweetened jam, and A. it wasn’t very good B. made way too much for 2 people. I’m glad this uses honey and not a big ol pile of white sugar. Now I just need to fall in love with blueberries and we’re set 🙂 Would this work with other fruit? Since I am moving in a week, this small batch of jam is perfect! I love blueberries. Perfect timing! Have a good move Nicole! Love it! I have a sudden craving for blueberry jam. I agree Joy, I was amazed to find how easy it is to make! Love homemade jam, I really love how easy it is to make and that you added honey and a touch of cinnamon. Delicious! Going to make this!! Love that you used honey instead of sugar! What a deep beautiful color! This jam looks really delicious – I love homemade jams! Me too! Thanks for stopping by Amy! Yum! Blueberry is seriously one of my favorite flavors! This is just perfect in every way!! I love homemade jam! I would have never though of pairing blueberry and cinnamon together but it sounds yummy! I bet it’s wonderful too if you baked with it. 🙂 Thanks for this recipe Pamela! MMMM, I bet it would be. I’d love to make some jam squares with this! Thanks for stopping by Anne! Mister Donut! Now that is a blast from the past. I used to hang out there with friends on Friday and Saturday nights, eating the day-old donut holes, drinking coffee until 2 am…until they closed and it became a Tobacco Outlet. We used to get donuts there every Sunday though. I loved the Triple Chocolate. 23 pounds! You be jammin girl, hard! I yet have to make blueberry jam…thanks for the recipe…simple and delicious! I will ever be able to can jam again without hummin’ this song. Thanks. I am so on this! You make it just jump out at us! Pinning. It’s all so very gorgeous! The things we’d do for a donut…my son is the same way! oooh! I’ve been looking for an easy jam recipe that doesn’t require boat loads of fruit! Agreed, smaller amounts always do better for me. Hope you give it a try! My mom makes the best blueberry jam… but she lives so far away I rarely get it anymore 🙁 Time to make it myself! 🙁 I hope this does the trick for you! Blueberries are one of my husband’s favorite berry fruit and he only eats blueberry jam if he has to. Even I would go for small batches of different jams rather than several bottles of same jam. Thank you for stopping by and I am glad you did as I have found your site now. Right now I have 3 small batches of strawberry, blueberry and raspberry in my fridge, that way I can pick and choose and none of it is going to go bad. 🙂 Thanks for stopping by! Hi Joan, you can use 1/4 cup sugar instead of 1/4 cup honey. Enjoy! Thanks for this wonderful recipe. I love fresh and homemade jam. Can this jam be canned in rolling bath canner? This jam was tha bombs! Perfect amount of sweetness, not too much honey, totally allows the blueberry flavor to shine through without being overshadowed by added flavors. Just blueberry goodness. Used it make a blueberry cheese danish, the jam really complimented the pastry. Can I use white granulated sugar instead of honey? How much should I add? Thanks! Hi Justin, there’s no water added for this recipe. Enjoy. I like to make my jams in the bread machine. It saves time. Hey Kerri, I’ve also made it with raspberries and it was delicious. It’s not watery at all and keeps a good jam consistency. Enjoy. Can you freeze this jam? Thanks for the terrific recipe. It is delicious and so easy! I was wondering if i could freeze it? Hey Margo, I’ve never frozen this jam, but I don’t see why you couldn’t. Enjoy and good luck! Hi Pamela! Thanks for sharing the love. I’m 20 min into simmering my first batch. Best to stir or not to stir or does it matter? It’s looking pretty liquidy still. Keep simmering as long as it takes? Hey Krystel, once simmering I will stir it a couple times while I check it’s consistency. If it seems liquidy you can turn up the heat a little bit and that should do the trick. Hope you enjoy! Can this jam be frozen? Just made it, looks and smells soooo good! Just one question, do I have tobket it cool first before putting it in a jar and refrigerate?….. I’m a first timer! Hey Tammy, enjoy this jam! I recommend transferring it to a jar and letting it cool for a little bit before putting in the refrigerator. this is so great, I have made it time and time again, I get so excited when I find blueberries on sale. I have never made it with lemon juice, didn’t have any the first time so subbed it with lime juice, liked it so much we just kept it that way, well now I find myself in another predicament no lime juice, oh no!! no lemon either, already started everything , thinking ok the only other citrus I have is oranges, in the pot now, smells good, crossing fingers. I made butter cookie thumbprints with this in it, all gone in a min. Hey Mary, happy you enjoyed this jam! Thanks for commenting and letting me know. Hello Raabia, I don’t mash them up prior. After heat is added and you bring them to a boil, I just stir and you’ll see they will naturally start to mush up. Enjoy! Can frozen blueberries (and other fruits like strawberries) be used instead of fresh? Hey Leslie, yes you can use frozen berries, just make sure to defrost them first. Also, I’d keep a eye on them as they might cook a little bit quicker! Enjoy the jam! Enjoy the jam Michelle! I love it with homemade bread! Could I use a sweetener instead of honey? I have 3 lbs of Blueberries and although I like the small batch recipe you have provided and love the use of honey as the sweetener, I am wondering if you simply double or triple the recipe depending on the amount of blueberries you have available? Also, can this jam be processed to allow for longer storage? Hey Berrie! A pint of blueberries is about 12 ounces! Hope this helps you and you like the jam! I don’t happen to have any honey on hand at the moment. If I use agave, do you think I ought to still use 1/4 cup? Thank you! Hey Heidi, yes you can equally substitute agave for honey 1:1. Hope this helps, enjoy! I’m so happy you liked this jam! I love how easy it is to make too! Thanks for commenting! Can you use agave nectar instead of honey? Yes you can equally substitute agave for honey 1:1. Hope this helps, enjoy! This was delicious and so easy! Followed the recipe exactly! Love how it made a small batch! Definitely will make again! Thanks Amie, I love that it makes a small batch too! Thanks for commenting! I like the no sugar part, but would like to make a few batches, can I process the jars after making it so I can keep them longer. Hey Susanne, yes, you can can this jam. WONDERFUL!!! Just made a pint …so easy; solo delish. Absolutely love the 1 pint amount! Thank you 4 this recipe. Now I have the fever for full canning process. On to the Pear Rasberry Jam using water bath for 6 half pints. Gradual learner here. Hey Judy, I’m so happy you enjoyed this jam recipe! Thanks for commenting! Have you ever made this with lime or with lavender? I wanted to make a batch with each and was wondering how you would incorporate these other ingredients? Hey Kaci, do you mean you’d like to add lime or lavender to the blueberry jam? Let me know and I will try to help you! Hey Deni, I can’t 100% tell you this will work as I haven’t tried it myself. Corn Syrup is a common substitution for honey, and if you’re ok with it taking away some of the blueberry fruit flavor, I say it’s worth a shot. How many cups would equal 1 pint blueberries? Hey Angela, 1 pint of blueberries equals about 2 cups. Enjoy the jam!